Printmaking is a unique medium in the art world. Paintings, drawings, collages, scrapbooks, and other artistic creations are all single, separate works that can never be reproduced, only copied. Printmaking, on the other hand, is the process of creating artworks through printing, typically on paper. The process is capable of producing multiples of the same piece or art, which are called prints. Each print is not a copy, but an original, since it is not a reproduction of another work of art. There are several ways to make gorgeous prints, and the methods to mass-produce these nearly identical artworks combine aspects of crafting, composition, color, and other studies. MisterArt.com offers everyday discounts on all of the art supplies you need to begin creating your own prints today! In fact, MisterArt.com guarantees the lowest-priced printmaking supplies on the Internet. If you can find a lower price online for the same name-brand merchandise, we'll gladly match it! Before you purchase printmaking supplies, however, it's best to know what you're looking for. This guide details the basic tools and techniques that are used in many different kinds of printmaking, such as engraving, etching, lithography, screen-printing, and more! A brayer is a hand roller used in printmaking techniques to spread ink. Brayers are typically composed of a handle and a cylinder that are rolled over a surface to evenly distribute ink, adhesive, or another art supply used in printmaking. Because there are so many different kinds of printmaking projects, brayers come in a wide variety of sizes and are constructed from a wide variety of materials. Different brayers have different properties and strengths. Rubber brayers are carvable and terrific for many creative techniques. Brayers constructed from soft rubber are often considered the best for printmaking, memory albums and scrapbooks, stamping, and home decor. Acrylic brayers are more durable than rubber brayers and are useful for printmaking using tougher materials and inks. Acrylic brayers typically have the smoothest rollers available. Foam brayers utilize absorbent rollers to create unique printmaking effects. These brayers are great for use with stencils, cutouts, printmaking, and other water-based painting and printing techniques. The foam texture provides unusual effects similar to airbrush, spatter, stipple, and dry-brush techniques due to its spongy nature. No matter what style of brayer best suits your latest project, you'll find the best price online at MisterArt.com! Intaglio is a kind of printmaking which involves incising designs, characters, or drawings into a smooth, flat surface, which is known as a matrix or plate. Once a design suitable for printing has been carved into the matrix, the surface of the intaglio plate is covered in thick ink to ensure that the grooves cut into the matrix are impregnated with pigment. Then the excess ink is wiped off and a damp piece of paper is placed on top of the plate. The plate and paper are then run through a printing press that, through pressure, transfers the ink from the recesses of the plate to the paper, creating a print. Etching is a form of intaglio printing in which acid is used to cut designs into metal printing plates. The metal (usually copper, zinc or steel) plate is typically covered with a waxy ground resistant to acid. The artist then scratches off the ground with a pointed etching needle where he/she wants a line to appear in the finished piece, so exposing the bare metal. An acid wash eats away at the exposed portion of the plate, effectively carving a design. MisterArt.com has the Internet's best deals on everything artists need to get started etching today! Inking plates, inks, etching grounds, carving needles, burnishers, liquid asphaltum—you name it! Our everyday discounts and ultrafast delivery times make MisterArt.com the top choice for art supplies online. Linoleum and wood block printing are methods of printing in which artists carve their own printing matrices. In these methods of printing, a block of wood or linoleum is prepared as a relief matrix, which means portions of the matrix are cut away with a knife or chisel, leaving only the carved characters or image to be printed at the original surface level. There are several ways of producing a print using a linoleum or wood block carving, including stamping the inked block on to cloth or paper, creating a rubbing of the block, or running the inked block and paper through a printing press. Each of these methods has been in use by artists and scribes for centuries, especially in East Asia. Prints made using linoleum are sometimes referred to as linocuts. 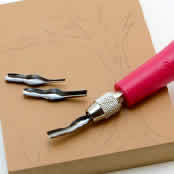 MisterArt.com stocks the Web's best selection of discount linoleum and wood block printing supplies. We'll take orders for wood blocks, linoleum plates, cutting tools, block printing ink, printing plates, and more 24/7 and ship them anywhere in the U.S.! Silk screen and lithography are two printmaking methods that use chemical processes to create an image. Silk screening, also commonly known as screenprinting, involves creating an image on a porous screen by masking sections with impermeable filler materials or emulsions, including photo emulsions. By blocking off portions of the screen, a stencil is created. The screen is then impregnated with ink and placed down on a surface such as a t-shirt or canvas and rubbed with a squeegee. The squeegee transfers the ink in the screen to the surface below, but the ink is only transferred through the sections of the screen that have not been masked off, so only the image that has been created on the screen is inked. Screenprinting is more versatile than traditional printing techniques because the surface does not have to be printed under pressure, as with etchings or lithographs. The surface being printed doesn't even have to be flat. Screenprinting inks can be used with a variety of materials, such as textiles, ceramics, wood, paper, glass, metal, and plastic. As a result, screen printing is used in many different industries-- from clothing to product labels to circuit board printing-- in addition to fine art. Lithography uses solid printing plates instead of permeable screens. These textured printing plates are covered with a photosensitive emulsion before a photographic negative of an image is placed in contact with the emulsion and the plate is exposed to light. The image on the printing plate is developed much the same as a photographic print, but using this oily emulsion rather than ink. Modern plates can also be created digitally. Next, the plate is run through a printing press where rollers apply water that covers the blank portions of the plate but is repelled by the emulsion on the image area. Ink, applied by more rollers, is repelled by the water and only adheres to the emulsion over the image area. If all that sounds kind of complicated, it's not as bad as it sounds! In fact, MisterArt.com makes silk screen printing and lithography a snap by offering all the materials you'll need at discount prices! Our VIP members can save up to 75 percent off of accessories such as masking films and emulsions, adhering liquids, acrylic mediums, sets and kits, and much more! MisterArt.com has the best selection of screenprint and lithography inks, with many different colors, consistencies, and textures. Whether your next project calls from opaque coverage of dark fabrics, wood panels, untreated supports, leather, or some bizarre combination of all of them, you'll find the inks you need at our site. We have great deals on screen resists that are used for blocking out images on printing screens, too, and a selection of squeegees that are designed for all different kinds of surfaces. Like everything else at MisterArt.com, these art supplies are discounted every day! Printing press technology hasn't changed radically since the days of the Gutenburg Bible! These reliable mechanisms apply pressure to an inked surface resting upon media such as paper or cloth, transferring the inked text or image. Presses have been perfected over centuries in order to best reproduce sharp prints over and over again. The high-quality printing presses you'll find at MisterArt.com can be used for a variety of printmaking techniques, including linoleum block printing, collagraph printing, engraving, etching, and monoprinting. Macro and micro pressure gauges ensure that the perfect amount of pressure is applied to each print. We have presses in many different sizes in order to suit any printing project—and budget! If you're shopping online, you won't find a better price for professional-quality printing presses than the ones we offer at MisterArt.com. We guarantee it! Got all the supplies you need to start printing but still aren't sure how to get the best results? No problem! MisterArt.com's collection of books and media, including CD-ROMs and DVDs, is a fount of knowledge on every aspect of printmaking. From screen printing to etching and more, you'll find instruction and inspiration from our library of titles for less every day. We know books and media make the perfect gift for the master printer in your life, so we offer speedy shipping anywhere in the U.S. Relief printing—Parts of the printing surface that will be inked are left raised (the relief), while the remaining areas are cut away. Ink is applied to the matrix surface, typically with a roller or brayer, and then transferred to paper using direct pressure. A reverse image of the matrix is produced. Types of relief printing are woodcut, woodblock, block printing, linocut, linoleum block, and wood engraving. See relief printmaking products. Intaglio—This print making process is the opposite of relief printing. The image is drawn, cut, or etched into the matrix surface. The matrix is inked then wiped so the ink lies below the surface of the plate. The ink is transferred to the paper under pressure. Examples of intaglio are engraving, etching, drypoint, collagraph, aquatint, and mezzotint. See intaglio and engraving products. Planographic—This is based on the principle that oil and water don't mix. The image area of the plate attracts ink and the non-image areas repel ink. Matrices are typically stone or metal (zinc or aluminum plates). Lithography and monotyping are types of planographic techniques. See lithography products. Stencil—An image is imposed on a fine screen with blank areas coated with an impermeable substance called a screen filler or resist. Ink or paint is forced through the screen with a squeegee and onto the surface below, which could be a number of things including T-shirts, tote bags, or canvas. This process is also called serigraphy, screen printing, or silkscreening. See silkscreening products.